A gay 17-year-old asked his high school's straight football captain to the homecoming dance, and video of the epic "proposal" has gone viral. 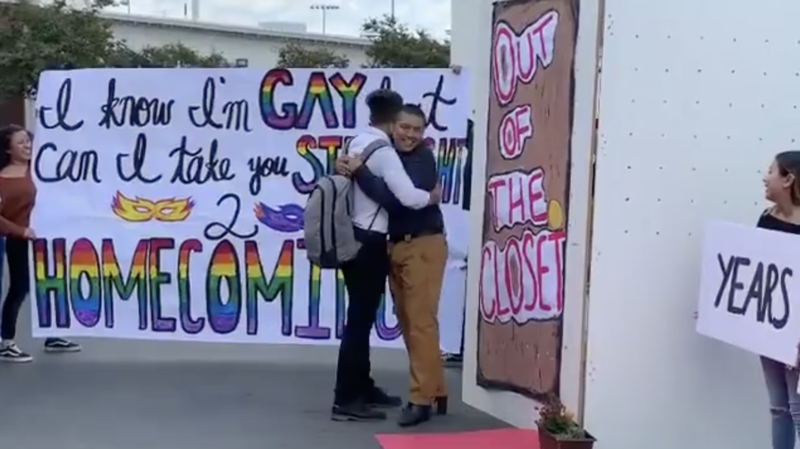 Alexander Duarte, a senior at Valley High School in Santa Ana, California, spent weeks preparing to ask his friend, Erick Pineda, to homecoming, Duarte wrote on Instagram. Pineda is straight, and Duarte said he's been a good friend for three years. Duarte told Instinct Magazine that Pineda joked about going to homecoming together, but Duarte thought it would be a good idea -- he just had to come up with an epic way to ask. On October 11, Duarte waited for Pineda outside of school with a huge banner. "I know I'm gay, but can I take you straight to homecoming?" the sign read. A second banner read "out of the closet." The surprise "was the effort of hard work between myself and others," Duarte wrote on Instagram. "What a coincidence that today is also National Coming Out Day." The senior shared video of the epic proposal on Instagram and it has gone viral. As Pineda walked up to the school, he was met with a crowd of cheering students. "You go, Erick! You're my hero!" a student is heard yelling in the background, as Pineda makes his way to a waiting Duarte. Duarte hid behind the banner until Pineda arrived. When he revealed himself, the friends hugged, and students let out a big cheer when Pineda answered the question on the banner. "Yes," he told Duarte. The two friends shared a big hug again. Duarte asked his straight friend to the dance on National Coming Out Day, which fell on October 11, and is a day for LGBTQ awareness. "It's very important for me to be going to Homecoming with Alexander because I'm setting an example for not only my school, but also my community," Pineda told Instinct, which is a gay men's lifestyle magazine. "I was definitely excited to be asked to homecoming because I knew how important this was for my friend and seeing the support from the staff and students was amazing." Duarte said he never had a date to a dance, and this year, something clicked inside, telling him to ask Erick. "For me it was also about setting an example for others on how to go all out on their proposals and, more importantly, that it is ok for a brown boy to ask another dude," the 17-year-old said.